The student chapter of the Faculty of Education on the North-West University’s (NWU’s) campus in Mahikeng hosted a public dialogue on 20 March 2018. The title of the dialogue, delivered by Dr Andrew Mutsvangwa, a senior lecturer in the faculty, was “BEd vs PGCE: the pros and cons for the potential new teacher”. “The BEd degree and the Postgraduate Certificate in Education (PGCE) are undoubtedly the flagship programmes of the Faculty of Education at the NWU,” said Dr Mutsvangwa. “These programmes form the core of the Initial Teacher Education (ITE) training programmes, and therefore the backbone of empowering the nation by educating the future generation. “The National Development Plan of South Africa clearly states the role and importance of the training of effective teachers, and it is therefore critical that higher education institutions design and develop high quality ITE curricula that meet the needs of the nation,” he added. “Particular attention is paid to the quality of our BEd and PGCE programmes. The purpose of this dialogue is to determine whether the ideals of producing the envisaged well-rounded teacher are being met, or if we need to review all ITE offerings within our institution. “We have to have robust debates to fine-tune our ITE qualifications so ensure that they are fit for purpose in the ever-changing teaching and learning landscape,” added Dr Mutsvangwa. Dr Mutsvangwa holds various positions both in industry and academia. He was the chairperson for the North West chapter of the Southern African Association for Research in Mathematics, Science and Technology Education from 2012 to 2014. He has also been the coordinator for the BEd programme from 2011 to 2014 at the campus in Mahikeng. 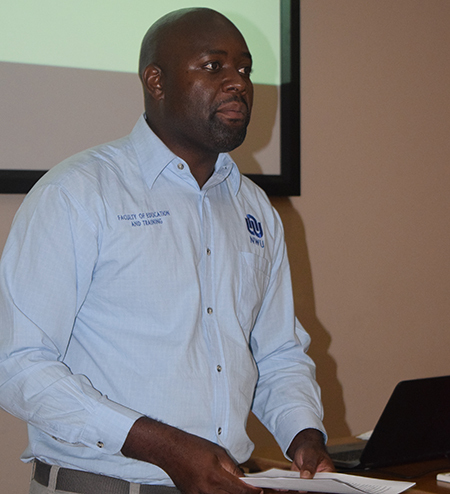 Dr Andrew Mutsvangwa, a senior lecturer in the NWU’s Faculty Education, talks to the faculty’s student chapter about the university’s BEd degree and Postgraduate Certificate in Education.